Sunday 21st June. A concert of Midsummer music, by a variety of composers. Featuring the Juniors, A Guitar Duo, and a smaller vocal ensemble. See poster and programme. Sunday 22nd March. Back to St Anne’s and St Andrew’s, for two fabulous Bach Cantatas, and a reprise of an anthem written by Mary Phillips for the Juniors back in 2012. See poster, programme and words. Sunday 25th January. A concert as part of the Brandenburg Choral Festival in St Paul’s Church, Covent Garden – we split the bill with Chorate. We sang pieces from our December concert: Haydn, Pergolesi, Frunza and a movement from the Brahms requiem (in memoriam for Siobhan O’Connor, a member of the choir who had died a few days before in a skiing accident). Sunday 7th December. A concert built around the Little Organ Mass by Haydn, and the Magnificat by Pergolesi. See poster & programme. Friday 21st – Sunday 23rd November. Four well-attended performances by the Junior Choir, plus many others, of the Happy Prince by Malcolm Williamson. See separate website. Sunday 8th June. 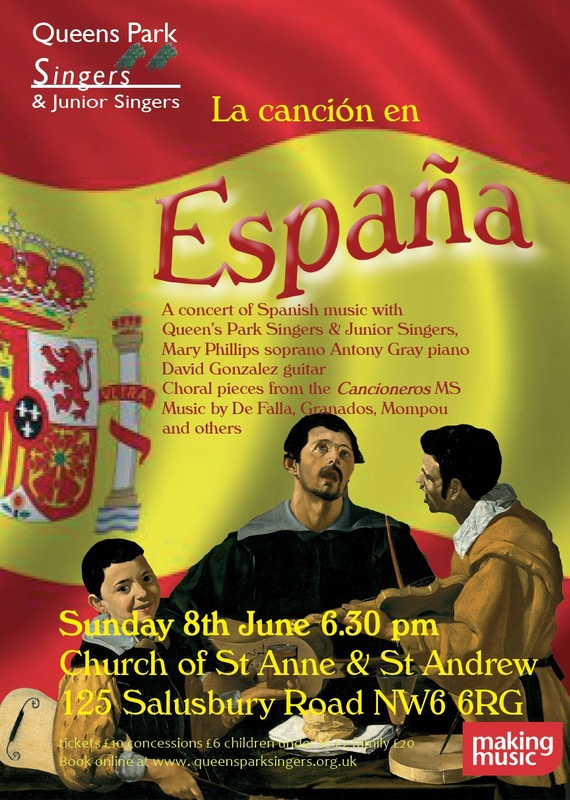 A concert of Spanish music. The choir sang music from the Cancioneros that were compiled in the 16th and 17th centuries and a piece by a more recent Catalan composer, who died in 1987. There were also songs by Manuel de Falla, sung by Mary, and guitar music. The Juniors also took part. See poster and programme. Sunday 16th March. The adult choir visit St Mark’s Hamilton Terrace for the first time, in a programme of music specially chosen to suit the spacious acoustics of St Mark’s. See poster and programme. Sunday 8th December 2013. Christmas concert featuring the fifth part of the Christmas Oratorio by J S Bach, with a range of other pieces of Christmas music. Our first joint concert with the Nonesuch Orchestra, who performed a Concerto Grosso by Corelli (“composed for Christmas night”). See poster, and the programme. Saturday 16th November 2013. Two sell-out and highly successful performances, at St Mark’s Church Hamilton Terrace, of Noye’s Fludde by Benjamin Britten. The Juniors and the DaCapo Music Foundation were directed by Mary Phillips. Featured Roger Bloomfield as Noah! See the special website, and in particular the photograph gallery. Sunday 9th June 2013. A concert of some of the most beautiful and thrilling choral music ever written, taken from Operas composed by major figures of the past 400 years. See poster and programme. Sunday 10th March 2013. A concert to mark Mothers’s day, with a wide range of music (Parsons, Brahms, Tippett, Grieg, Rachmaninov etc), and also readings of poems and a contribution from the Juniors. See poster andprogramme.